Stepping back, so readers can move forward. Get more details on these Lesson Sets and download a free lesson sampler. 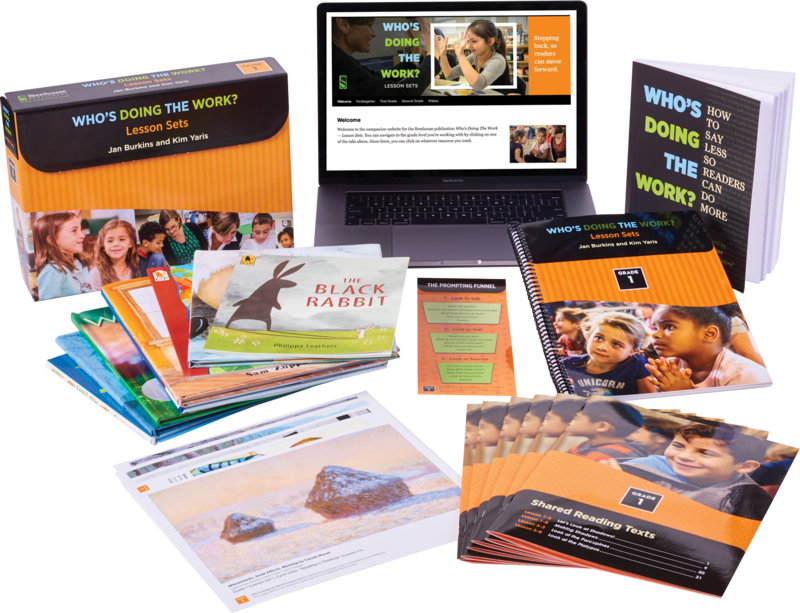 In this groundbreaking classroom resource, Jan Burkins and Kim Yaris provide everything teachers need to implement the ideas from their bestselling book, Who's Doing the Work? How to Say Less So Readers Can Do More. The lesson sets map out a systematic approach to helping K-2 Students grow into independent and proficient readers. Access the on-demand webinar "How to Make Learning Stick: 3 Ways to Boost Your Reading Instruction," presented by Jan Burkins & Kim Yaris. 9% shipping will be added for this product. The 30 lessons in each grade level work well in conjunction with any reading program and do not require on-site training. For teachers new to balanced literacy, they provide an accessible introduction to four key instructional modes: read aloud, shared reading, guided reading, and independent reading. For other teachers, the lessons offer a fresh perspective on such techniques as prompting, using wait time, and reducing scaffolding so that more responsibility is shifted to the student. After using the lesson sets, teachers will return to their existing reading program with new insights and a deeper understanding of their students' abilities. and a comprehensive website featuring 60 minutes of videos in which Jan and Kim demonstrate the teaching strategies in diverse K-2 classrooms. As you work through the lessons with your students, you will find yourself saying less and watching your students grow as independent readers and thinkers. Learn more about Who's Doing the Work? Independent Library Collections. Coming Summer 2019: Who's Doing the Work? Lesson Sets for grades 3-5. Jan Burkins and Kim Yaris: Who's Doing the Work? The lessons are complementary to almost any framework a school is using. I love the sequence of the sets--beginning with art and moving through read aloud, shared reading, guided reading and independent reading. And I have found the Prompting Funnel to be one of the most helpful tools I've used--and the one that has an almost immediate impact.